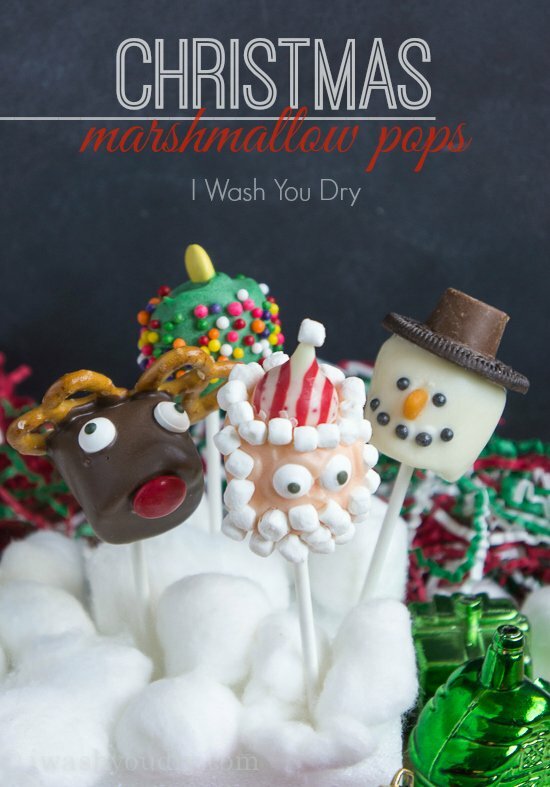 I’m seriously so excited to share these Christmas Marshmallow Pops with you guys!! EEK!! Look how cute they are!!! 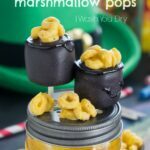 These fun little treats are super easy to make. 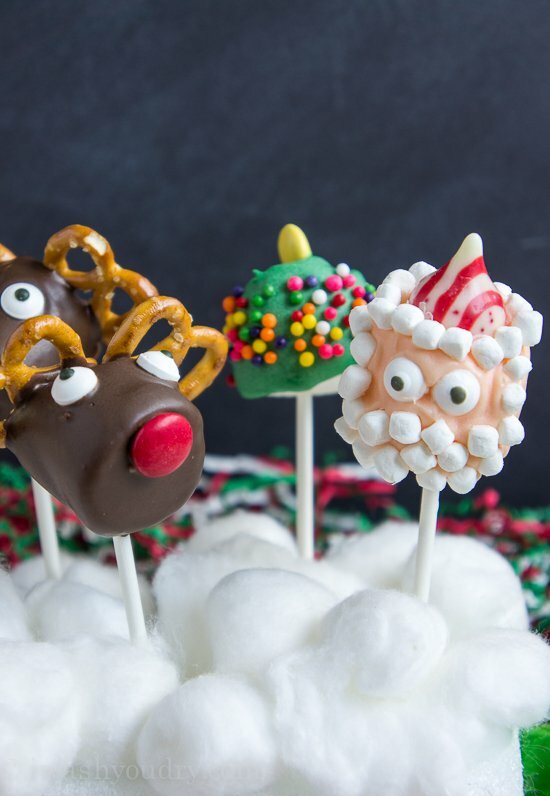 I made 5 of each of these Christmas Marshmallow Pops and from start to finish it took me less than an hour. That’s including the time it took me to figure out the logistics of them and put them together. 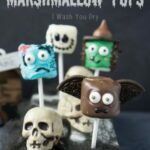 You see, back when I shared these Halloween Marshmallow Pops with you, I also started jotting down sketches of these Christmas Marshmallow Pops too. I have serious OCD issues. 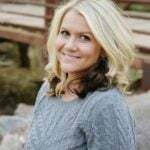 I have been super excited to share them with you ever since. 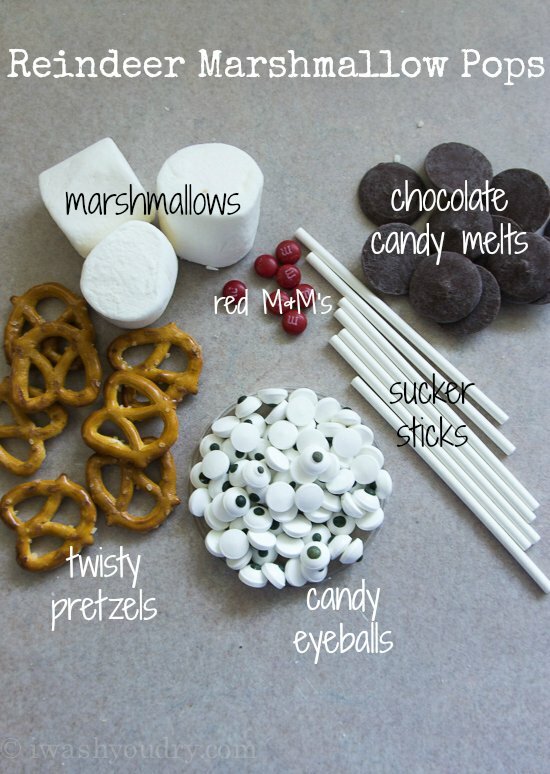 You can find all of the ingredients to make these guys at a Walmart or at a craft store in the candy making isle. In the picture above I show the mini M&M candies, but in actuality you’re going to want the normal size ones. The miniature ones were just too small. The stick goes in first, then dip it in the melted chocolate. Put an M&M on for the nose, then the eyeballs on. Lay it on top of two twisty pretzels and let it dry laying down on a sheet of wax paper. 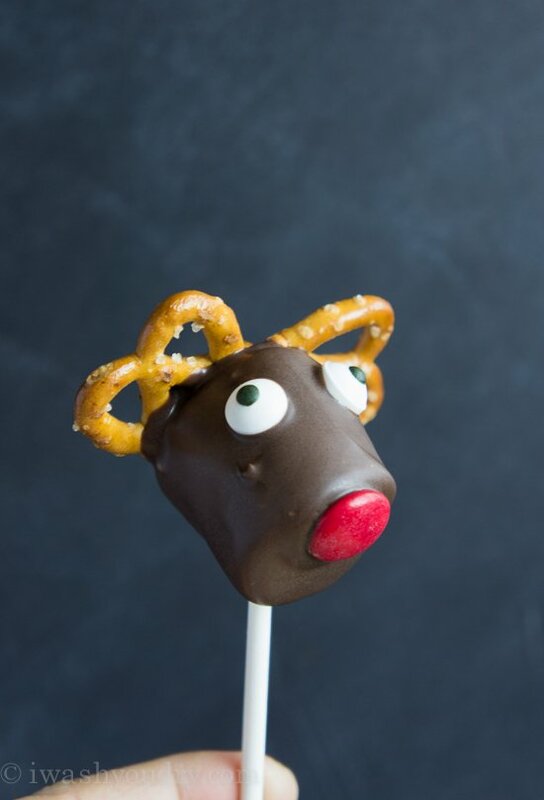 Isn’t that just the cutest and tastiest little Reindeer Marshmallow Pop you’ve ever seen?!?! You better make enough of them so that they can pull Santa’s sled! The Santa Claus Marshmallow Pop is probably one of my favorites. I wasn’t sure if he was going to work out, but he turned out even cuter than I imagined! If you can find peach colored candy melts (something similar to skin color), then go ahead and buy those ones. I just happened to have a little bit of orange and white, so I mixed them to make a skin color for Santa’s face. I melted about a handful of the white wafers with about 5 wafers of the orange and I think it turned out beautifully. 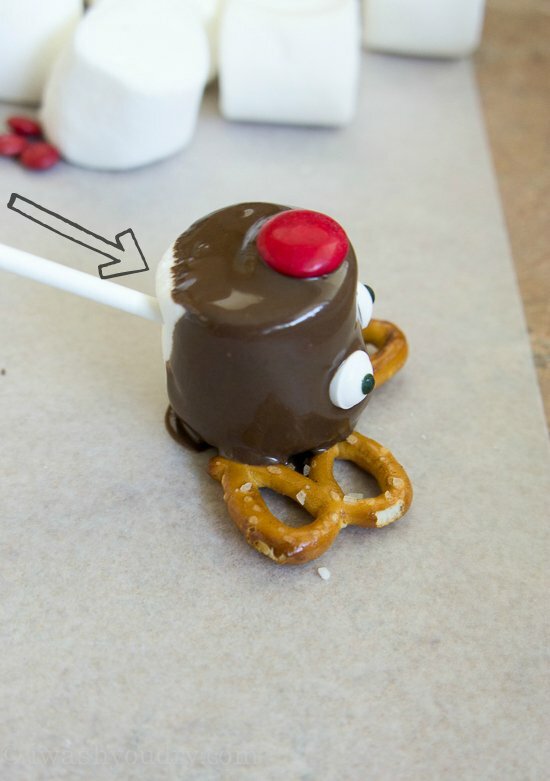 To make the Santa start by pushing the stick in the bottom of the marshmallow. 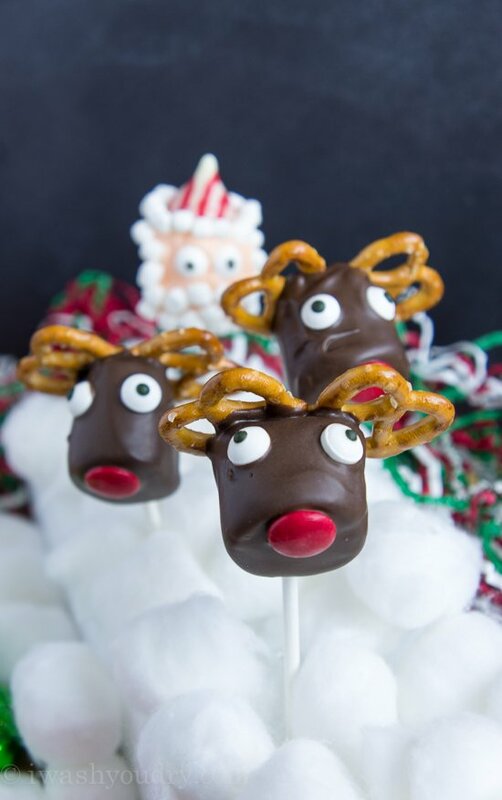 Dip in your peach colored chocolates, then top with a Candy Cane Kiss. 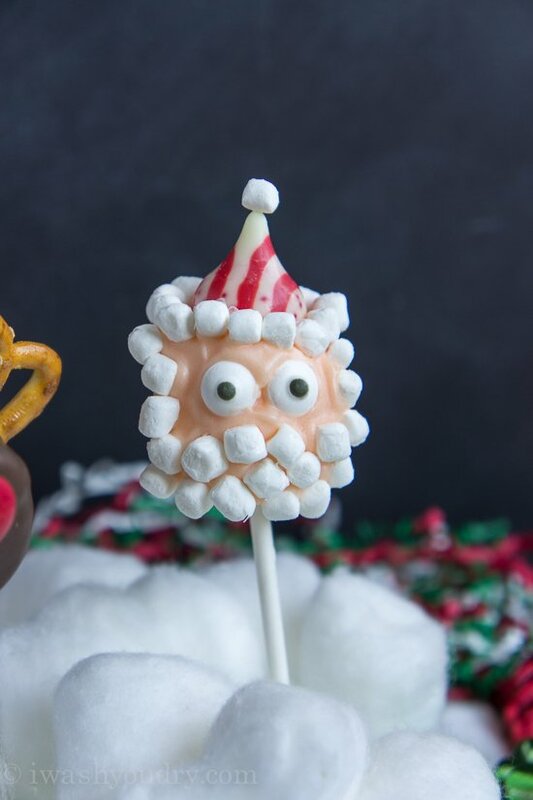 Put on two eyeballs, then quickly, but carefully place the miniature marshmallow bits around the base of the candy cane kiss, then down and around his eyes making a beard. I didn’t cover the backside of the marshmallow, but you can if you want. 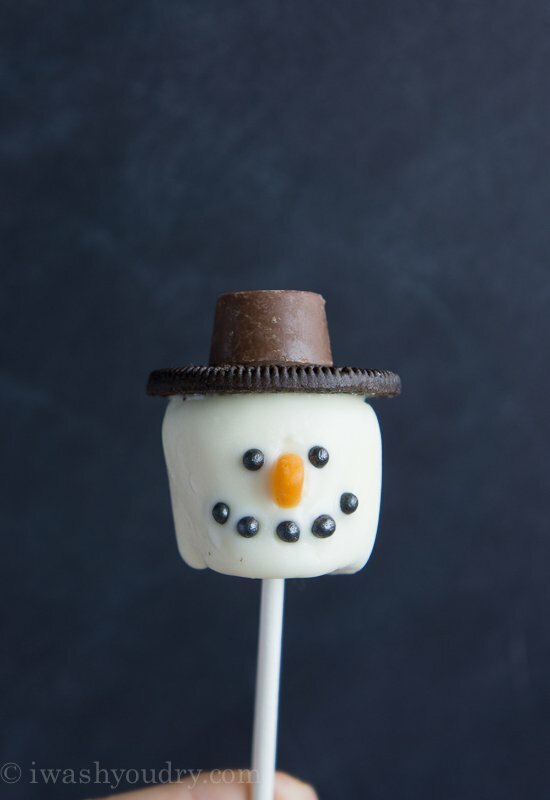 Last but not least is my Frosty the Snowman Marshmallow Pop! These guys are just too adorable. 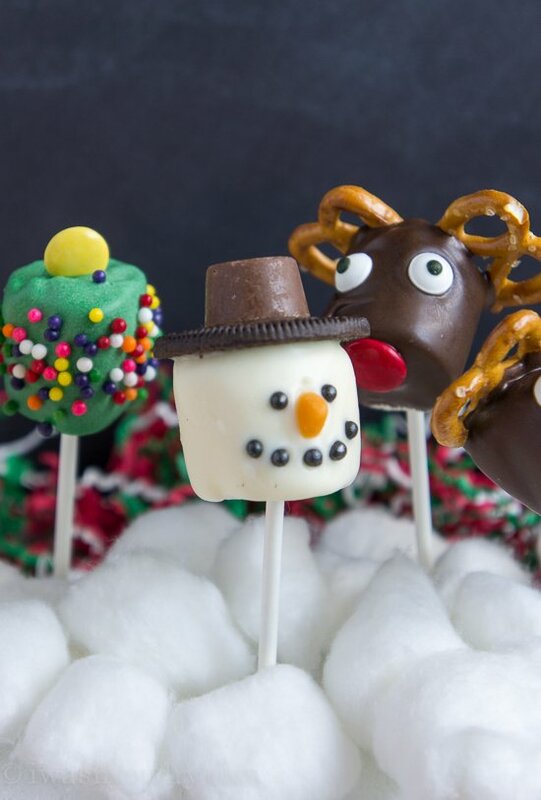 To assemble Frosty all you need to do is push the stick in the bottom of the marshmallow, dip into the melted chocolates, then top with a single Oreo cookie. 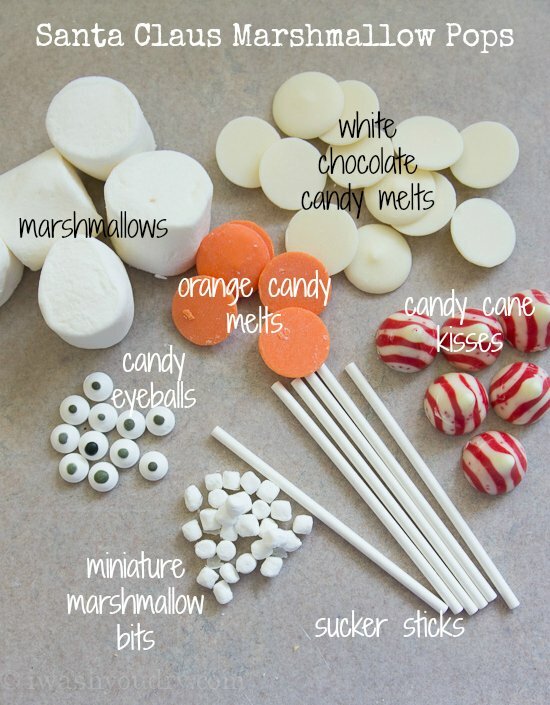 Cut the tips of the s’mores candy corn off and use those as a nose. 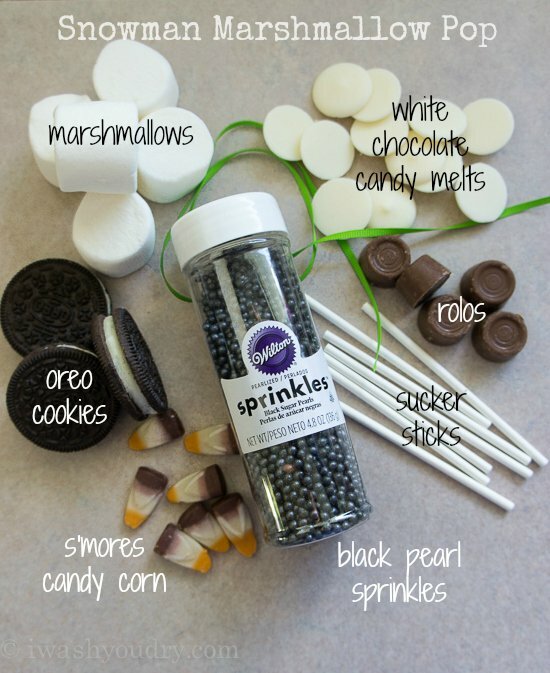 Place the black sugar pearl sprinkles on for eyes and then make a smiley face with them too. Let it dry, then use a dab of melted chocolate on top of the Oreo to secure the rolo candy to finish off the hat. You can tie a ribbon around the neck to resemble a scarf if you want as well! I also made a Christmas Tree Marshmallow Pop by dipping a marshmallow in green candy melts, then sprinkling with multicolored sprinkles and topping with a yellow M&M candy. 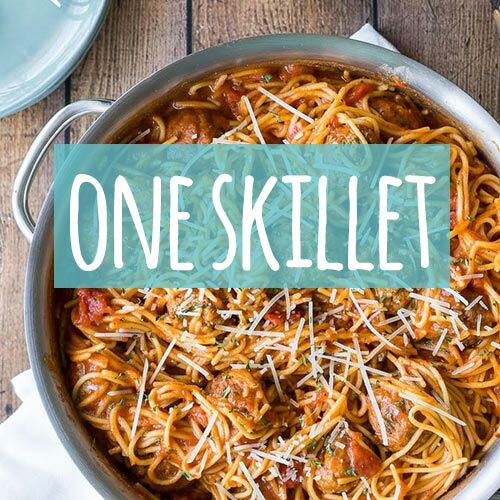 It’s a super quick and easy one to do too. 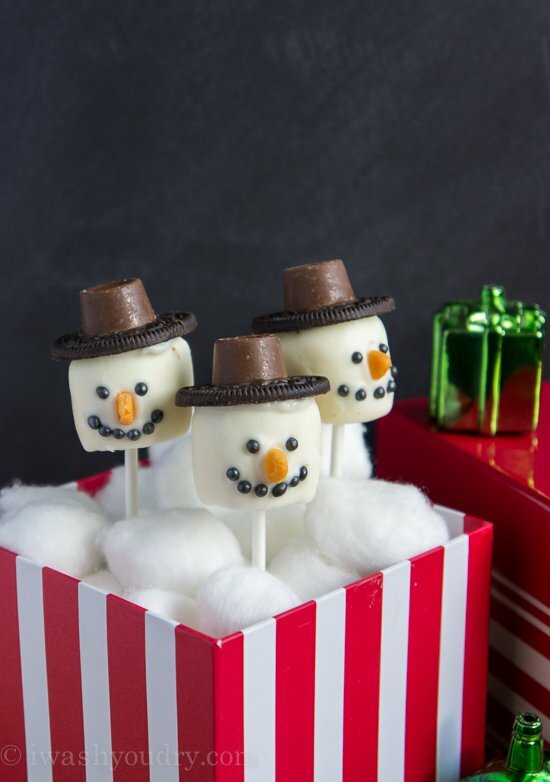 These Christmas Marshmallow Pops would make the perfect gift, or just a fun evening activity this Christmas season! I hope you enjoy making these as much as I did!! How long do these last? 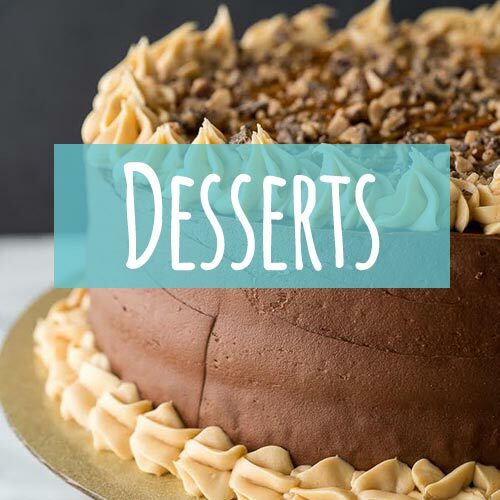 Would it be okay to make a batch to send to my cousins in another state? Shipping would take a few days. Love these. 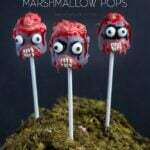 Will make these with my grandkids. Okay, that’s just plain adorable! I love every one of these! Those are so stinking cute!!! Good job girl!! !